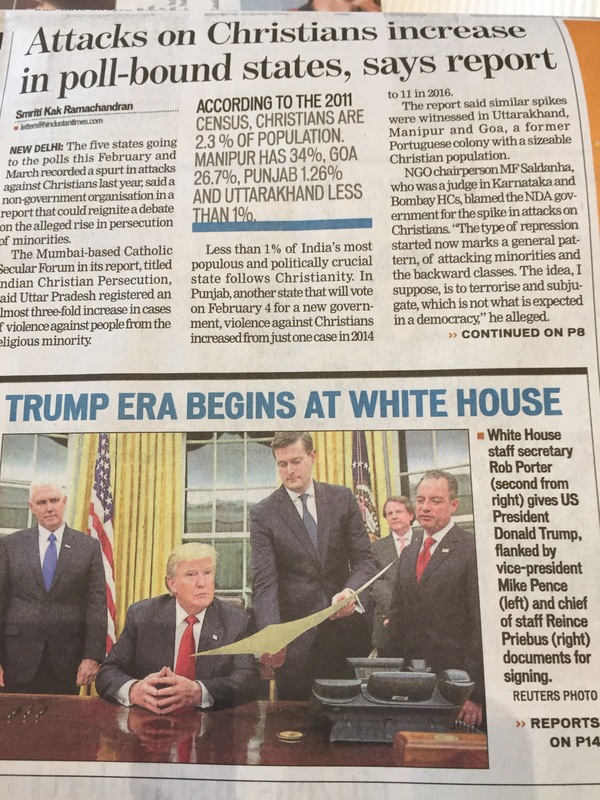 Yesterday here in India I saw a jarring pair of articles on top of each other in the Hindustan Times. The first detailed a report on the rise last year in persecution of Christians in some states in India, according to the Mumbai-based Catholic Secular Forum. In Uttar Pradesh, the largest state in India with over 180 million people, there had been a three-fold increase in attacks against Christians. Then right under it is a headline and photo announcing that the Trump Era Begins at White House. An administration that over 80% of Evangelical Christians in the US reportedly voted for. We are of course early in the “Trump era”, and it will take time to see the direction and consequences of his policies (and personality) both domestically and globally. I am concerned when I see the Church aligned with political power, rather than keeping a prophetic and critical distance. What does power do to corrupt the soul of a Church? We must remember of course that there are many viewpoints on how close or far the Church should be from the “center of power”. For the five Christian ministers who gave prayers at President Trump’s inauguration last week, there were many more who would have refused to do so. The dangers of a Church entwined with political power are numerous in history. Soul corruption is a very real and constant threat. There are those claiming that Trump is a “Cyrus” for our time, chosen by God. ( Referring to the Persian King also mentioned in the Old Testament who opened the doors for the Jews to rebuild the temple.) But there are also many other Christians who would challenge and dispute that word. What will President Trump, or any leader for that matter, do with power in their hands? What is the role of the Church to call him or any leader to account? How can the Church do that if there is no critical and prophetic distance, indeed if the Church itself is not accountable for what it says or pronounces? Yet wouldn’t it be better if Christians were in power, if they could stop the persecution for the faith going on in many places around the world? A good question, but one that must be responded to in the reality of the suffering of Jesus on the Cross. We are called to walk in His steps, not to try and circumvent or eliminate the possibility of where faithful, suffering love for the poor and strangers among us will lead us. Because that kind of loving service is often not the “popular” way. But it is the calling of the Church to serve in sacrificial love no matter what the cost. Sometimes when I see articles like these two next to each other, it feels like we live on different planets, not just different countries or regions. Yet we do live on the same Earth, and our calling as Christians, or humans for that matter, is to live lives seeking to love rather than grasping for cultural or political power. To love from the bottom up, rather than imposing or legislating from the top down our own brand of morality that may even be disagreed with by others in our same faith. To love from the Cross, and walk in the power of weakness. I have no idea what the next few years will bring in India or the US. But we are called as Christians in both countries to bear faithful witness to the love and reality of Christ, and to walk in His suffering steps, no matter where that may lead. There is no power on earth that can ultimately prevail over, or substitute for, that kind of love. Previous Post Is Anything Worth Dying For? Next Post What good can come from an old, dead stump?